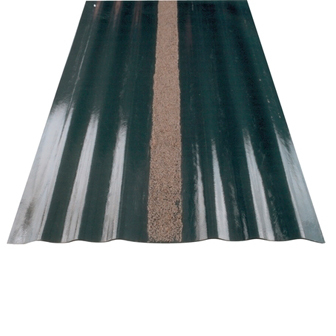 The Corodrain Joining Gutter provides a waterproof seal between the adjacent roofs of terraced houses or where a new roof needs to join an existing roof. The gutter can join any combination of slates, double lap or interlocking tiles with minimal disturbance to the adjacent roof. The design ensures there is a minimum kick up of the slates. There is a 50mm wide sanded strip for mortar retention. GRP lasts as long as lead, is tougher, cheaper, more resistant to accidental damage, and is less prone to theft or vandalism. Using preformed GRP joining gutter saves significant installation time over traditional methods. Roofers report elimination of many problems with valley troughs when changing from lead to CORODRAIN GRP. Coloured lead grey as standard (other colours available on request).